Lately laparoscopy has been challenged by a very old technique, the culdoscopy, now refined and called transvaginal hydrolaparoscopy. The understandable aim is to bring the diagnosis and treatment within the concept of the see and treat clinic, what you see can be cured at the same time or at least interpreted. In our opinion this concept works when only small problems are expected and when one does not need to explore the upper part of the pelvis and the anterior part of the uterus. In all other circumstances full laparoscopy is a necessity. In fertility laparoscopy we are therefor faced with the must of selecting our patients very carefully. Case history and Transvaginal Ultrasound are useful to help in this selection. Obviously whatever problem solving we can do in a see and treat fashion has an impact on the cost benefit scales. It is however not cost effective to combine both techniques and having the laparoscopy follow a transvaginal hydrolaparoscopy carries risks mainly in the field of infection spreading, an item we want to avoid in fertility exploration and surgery. Fig. 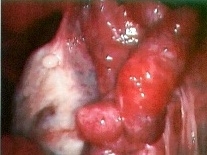 1 the combination of congenital abnormality and ovarian cyst is an indication for classical laparoscopy. In fig. 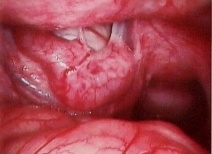 2 the importance of taking all necessary precautions in classical laparotomic microsurgery is highlighted by the talcum grnulomas on the surface of the ovaries, a diagnosis equally feasable by both techniques. The peritubal adhesions that are visible on fig. 3 can be treated by transvaginal hydrolaparoscopy but their extent and origin can only be evaluated by classical laparoscopy. Macroscopic aspect evaluation of the tube as in fig. 4 is better done by transvaginal hydrolaparoscopy as the fimbriae and the tube will floate in the liquid allowing for a better interpretation of the function. 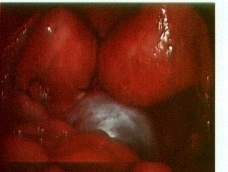 The treatment of this hydrosalpinx however should be left to classical laparoscopic surgery. In our opinion the techniques of surgical treatment have been laid down and proven by large numbers and have been double-checked by outcome. In fertility, outcome means a viable child at the end of a term pregnancy. Techniques that do not comply to these criteria should be catalogued as experimental and performed in specialized centres with patients' written and documented approval. Even if very promising.